Spring, Texas (United States) – March 2, 2015 – Europeanbarging is pleased to offer a 25% Discount on several departures on the 18 passenger Le Phenicien barge cruising in the Provence Region of France. Rates are from $3127 per person for the discounted Mid Season rate and $3390 in Regular Season. Individual cabin booking dates are April 19; May 10, 24 and June 21st. Dates with the discount available to charter the whole barge are April 12th and 26th. While cruising along the Rhone river, the Petit Rhone and the canal of Camargue, you will discover historical sites renowned worldwide as Avignon, the giant roman aqueduct “Le Pont du gard”, the medieval village of Les Baux de Provence, Arles, one of the very best wineries in Chateauneuf-du-Pape, one of the most famous ranch of The Camargue and the walled city of Aigues-Mortes. We could talk about the great standard of comfort that you can find on board “LE PHENICIEN” but no explanation and no picture is relevant enough to make you feel the peculiar atmosphere of this vessel. This is worth a visit. The real issue is: why is “LE PHENICIEN” so different ? In cruising configuration, you can have a drink at the bar or take a comfortable seat at the lounges and relax with friends, play chess, read a book, listen to music, do nothing else but enjoy the sight through the large windows. Would the weather be nice enough for you ? Move to the sun deck and get a little tan. Would it be too hot? Stay inside and enjoy the air-conditioning. Would it be too cold or rainy (very seldom but…) enjoy the central heating in your cabin or in the vast lounges of the main deck. Thanks to its peculiar “Double Decker” design and its great level of comfort, “LE PHENICIEN” is definitely the best place to organize any kind of seminar, VIP or customer event, training session, motivation or incentive program or other business event. Do you need a high level of intimacy? No standard hotel could provide an equivalent level of privacy and comfort than a barge navigating along the peaceful inland waterways. Do you need a strong “immersion” effect ? (in the figurative sense…), nothing will fit better than “LE PHENICIEN”. The unique pleasure of the cruise in addition. – The lower deck is dedicated to the accommodation. – The main deck is separated in 4 areas. – At the back, the crew apartments, the kitchens and the main lavatories. 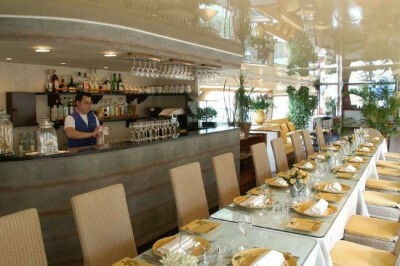 Then the Bar-Restaurant where you will have your meals or take a drink with other passengers. – Next to the restaurant but separated by movable panels, is available a vast lounge changed into a seminar room when required. – At the front, you can find the sun deck, the best place to make a break and enjoy the mild climate of the region. – All additional materials and equipment required for your event can be supplied upon request (as screens, boards, video equipment, sound systems, etc.). The organization of the cruise itself is very similar to the standard cruise. However, in business configuration different formats are proposed from 2 days, which is the very minimum to appreciate the cruise– to one week. Of course, the whole boat is booked for the period (Charter reservation). The boat can host from 9 persons in single accommodation and up to 18 persons in double.